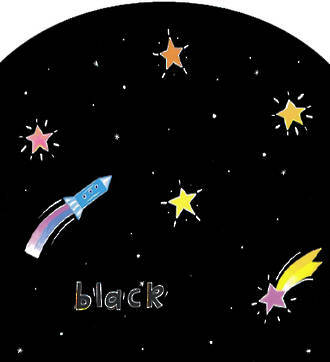 Black Space | Kids Video Song with FREE Lyrics & Activities! when my eyes are shut so tight. zooming in my space rocket, to a far out place. I'm on a mission to visit Mars! Children lie down and close their eyes. Listen to the song. Ask children about the mood - the atmosphere or feelings associated with the song. How does the song make you feel? Does the music make you feel like you are out in space? What can you imagine while you are listening to the song? 'Crayon scratch art' Use bright coloured crayons to completely colour in a blank piece of paper (blocks in different colours works well), don't leave any white paper showing. Use a brush to paint black paint over the entire picture. When the black paint has dried completely, start scratching the black paint with a sharp stick like a bamboo skewer or the back end of a thin paint brush. Create a space scene. It's magic! Talk about the planets, what is unique about each planet? : Mars, Venus, Earth, Mercury, Jupiter, Saturn, Uranus and Neptune.